It's always fun for me when I run across an heraldic mystery (e.g., who's arms are those? ), and then get to solve said mystery. It's even more fun when I can do this on the road, away from many of my heraldry books. (Though in this age of technological wonders, I can actually take much of my heraldic library - especially the general armorials and ordinaries - on the road with me, downloaded off such sites as Google books and the Internet Text Archive and saved as .pdf documents onto my 250 gigabyte external drive that literally will fit into my shirt pocket!) And it gets even better when, as this time, a bit of serendipity occurs, and I happen to run across a relevant entry in a book which I just happened to be reading at the time. 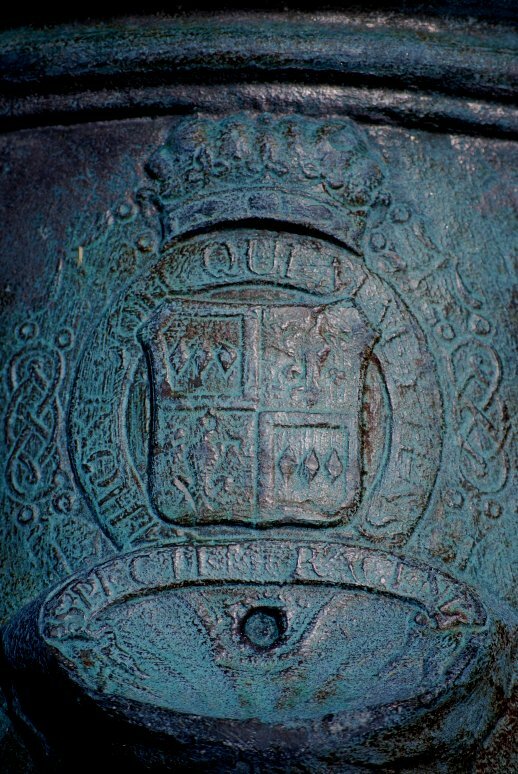 I'll discuss the heraldic mystery in this entry, and cover the solution in my next post. We were in Virginia for a week earlier this month, where I was scheduled to give a presentation to the Virginia Beach Genealogy Society. We'd decided to use the one night presentation as an excuse for a full-blown history and research vacation. We were visiting the battlefield site at Yorktown, where the British forces under Lord Cornwallis surrendered to the combined American and French forces during the American Revolutionary War. 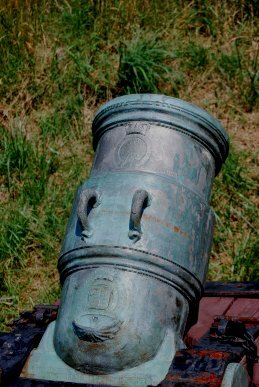 At one of the British redoubts, there was a line of mortars, each of which had two coats of arms on them. 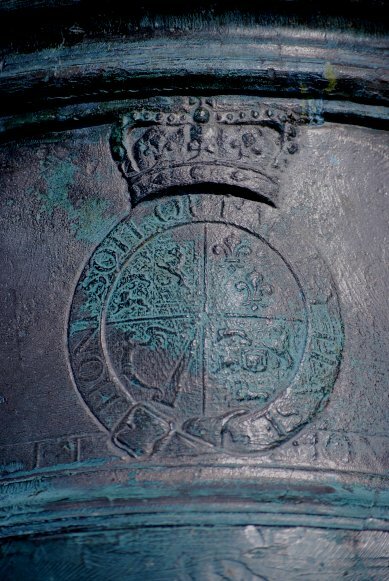 One, naturally and expectedly enough, was the Royal Arms as used by the Hanoverian Kings of Great Britain. The other, however, just above the touchhole to fire the mortar (now plugged), was not familiar to me. Hence the mystery. To whom did these arms belong? Given the garter with motto surrounding the shield, ensigned with the coronet of a duke, it clearly was someone of some importance, who was both a duke and a knight of the Order of the Garter. Could I determine who's arms these were? I took several photographs of the mortars and both coats of arms. That evening I hooked up my external hard drive with the heraldry books on it to my netbook and did some research. That, and a little bit of serendipity, gave me my answer, which will appear in the next post. 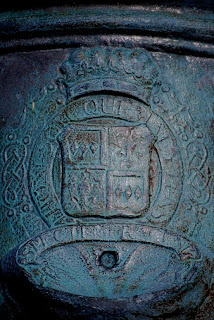 It appears to be the arms of the Duke of Manchester, but I have no idea why they would appear on this mortar. Wait until Monday, and the mystery will be explained!